Ms Emma Madriaga is 34 yrs. of age. She is 6th of 8 in the family. She is single and mother of a child of 3, a girl. She has completed a 2-year course for junior secretaries. She speaks and understands English well. She is from the province of Bataan, about 3 hours by road to Manila, 50 minutes by ferry boat. Ms Madriaga has been working for the same employer since she first came to Singapore in December 1989. Ms Madriaga has shown herself to be dependent and loyal to her employer. She began working for her employer in December 1989 and has been with her ever since, or for the past 11½ years, except for a 9-month break. The employer who is not keen to have to look for a live-in nanny every year or two will find this trait in Ms Madriaga desirable. 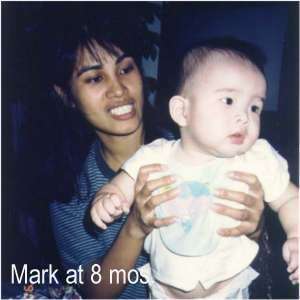 Among her duties, taking care of her employer's only child (shown on the left, at 8 months), a boy, is the most important. Emma's charge Mark is now 11 years. See photo of Emma and Mark taken on last October (2000). He was born two months after Emma started working for the family. As the mother was working then, care of the newborn baby was left to Emma, not to mention other duties: cooking, general cleaning and tidying and laundry and ironing. In fact Emma had been in sole charge until last year when her employer quit her job. Emma is familiar all aspects of child care. When the child (a boy) was still a baby, she slept with him and did night feeding so that her employer would be able to go to work fresh in the morning. She knows how to change diapers, sterilize bottles, prepare formula and, as the baby grows, solid food as well. She knows how to set the stage for a little child to learn. She would give him paper for colouring activities and she would tell stories of read to the child. When the child started school, Emma supervise him in his homework. When the child is sick and the mother was not a home, which was often the case until last year when her empoyer stopped working, Emma would bring him to see a doctor. Emma can cook quite well and often she would prepare the food when her employer invites friends home for dinner. She says "Everybody says that my cooking is good. And some of my employer's friends even ask me how I cook this dish or that." Date of Birth 09/12/1966 Religion R. C.
* ages of children or elderly person cared for at the end of the employment or at the time nanny's profile was created. I hereby declare that the information I have givenabove is accurate and that the documents submittedare authentic in every respect. Original application on file in S'pore.